The wood studs are joined together by screws or nails to form the structural frame. Its voids are filled with a thick BioF Trio isolation material. 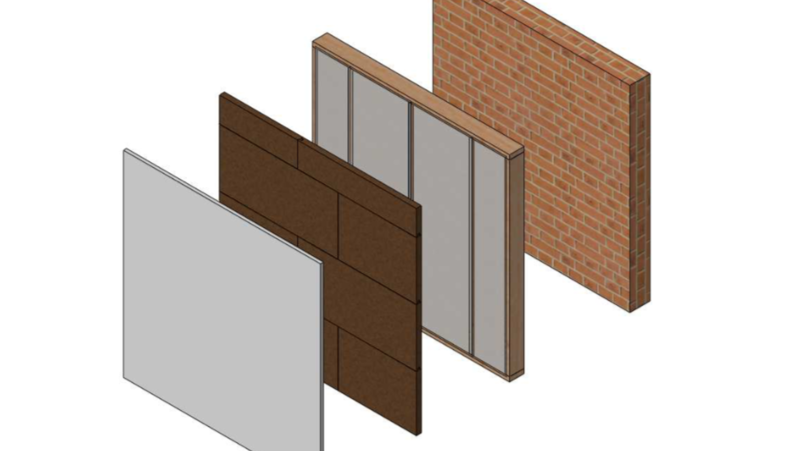 Then Isobio rigid panels with predefined dimensions are fixed to the wood studs using screws or nails. The hemp lime render, which is mainly composed of lime, hemp, and a lime based plaster, will be placed on top of the Isobio panels. The entire panel will be attached to an existing wall using a metallic solution which will depend of the type of façade. BioFib: it is an insulating material with an excellent mechanical strength. Because of its natural fibers, it is safe to use, soft to touch and easy to install in houses. Isobio panel: it is a bio-composite made of commercial hemp shiv grade and a thermosetting bio-based binder. This material is highly water repellent and acts as a fire retardant. Hemp lime render: it is a lightweight and stable bio-composite material. It can also be personalized by colouring it and acts as a fire retardant with optimal hygrothermal properties. They will aid in reducing the energy consumption needed for air conditioning housing. They will also protect the building from moisture-based damages and possible outbreaks due to temperature changes. All these make the buildings highly energy efficient while providing an optimal level of comfort for residents at any time of the year.